Gardner's Photographic Sketch Book of the War. Plate 46. 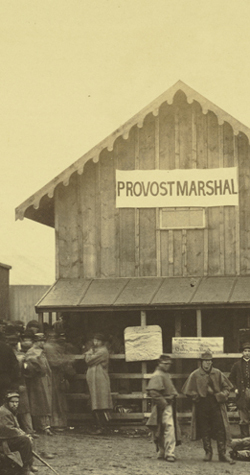 Provost Marshal’s Office. Aquia Creek, Virginia. One of the first operationsof the war (upon the Potomac) was the destruction of the wharf and depot of the Fredericksburg and Richmond Railraod at Aquia Creek, done by a small flotilla under command of Capt. Ward, U.S.N., whose flag-ship was a N. Y. towboat, turned into a gunboat, and called the Freeborn. The buildings were fired by shells, the enemy keeping up a lively fire also from a battery upon the hill and a small redoubt on the shore. When the rebels gave up the blockade of the Potomac, quite a chain of works existed there. In the winter of 1862 it became the base of supplies for the army at Falmouth; the wharf was rebuilt, greatly enlarged and improved, and quite a town of hastily but well-constructed buildings put up; among them, and close upon the railroad track, the Provost Marshal’s Office. To this office came daily crowds of applicants for passes; officers on welcome leave of absence; soldiers with hard-earned furloughs; sutlers and their clerks; negroes, anxious to get up to Washington to spend the generous wages (twenty-five dollars a month, besides rations and quarters) paid by the Quartermaster’s Department; all kinds of petty traders; visitors to the army; friends seeking the bodies of relatives slain in battle, or lying in hospital grave-yard, for removal; sick and wounded for hospital treatment; and last, though not least, ubiquitous members of the press, constantly going up or down. Soldiers and citizens who had business with the army in those days will not readily forget how limited was the tie between the arrival of the long train of cars from the front and the departure of the Washington boat; nor how often, after successfully elbowing a way in the motley crowd, and getting the pass vised, the end of the dock would be only reached in time to see the steamer moving swiftly down the creek to the Potomac. On such occasions two alternatives were open; to go back to the front till next morning, or remain and study character on the wharf, boarding at the sutler’s, and trusting to luck for a bed. As an instance of the variety of character, the writer has seen upon that dock, not only specimens of almost every European race, Africans and Indians, but Chinamen, dressed in army blue, and to all appearance good soldiers.